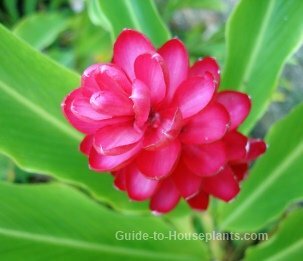 Many types of tropical flowers are grown indoors for their spectacular blooms in vibrant colors. Their tropical habitats span the globe from Hawaii to Costa Rica, Brazil to Malaysia... and that's just the beginning. Many flowering bulbs originate from tropical Africa: amaryllis, clivia and calla lilies are just a few dazzling flowers commonly grown indoors. Southeast Asia is rich in epiphytic orchids, and subtropical China and Japan have given us beautiful camellias and azaleas. 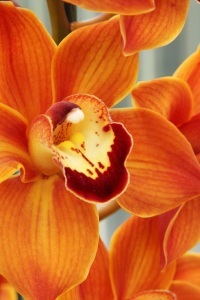 You can order tropical flowers online. 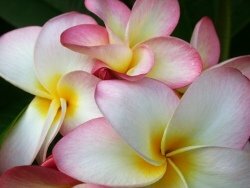 Flower delivery for orchid plants, anthurium, hibiscus and other Hawaiian tropical flowers is a fast and easy way to grow your collection. The frangipani tree is magnificent. Its branches are covered with big clusters of wonderfully fragrant flowers. This Central American native likes plenty of warmth, sunlight and humidity. If you can keep this plant happy, you'll enjoy its blooms all summer and fall. You'll want to give this glorious flowering tree some room to grow, too. Even planted in a pot, you can expect frangipani to reach several feet tall. A greenhouse or sunroom may be the ideal spot for it. 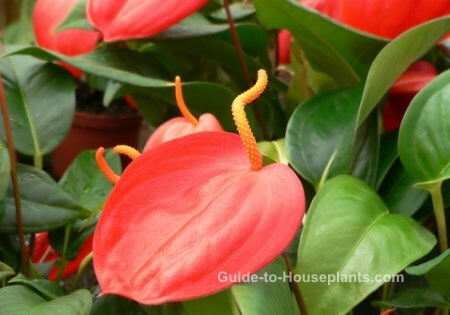 Few tropical flowering plants are as recognized as the Anthurium scherzerianum (shown above). Even if you didn't know its name, you've seen this brightly colored plant at florist's shops. Originally from Costa Rica, Flamingo Flower is now popularly grown in Hawaii. Fortunately for us, it's adaptable as a houseplant. Display it among other tropical plants -- or on its own. Those large, waxy, long-lasting spathes topped with a curly, orange spadix are sure to get attention and many compliments. Although orchids may seem intimidating, they're just as easy to grow as many other flowering house plants. You don't have to know all the fancy terms to get those gorgeous blooms. Just bring an orchid home and you'll learn as you go. If one type of orchid doesn't work for you, try another. It takes but a little success with these flowering beauties to want to grow more. Of all the orchids we love to grow, Cymbidium orchids are among the easiest to please indoors. From bright and bold to soft pastels, these prolific bloomers have something to offer everyone. Many types of tropical flowers grow best with higher-than-average relative humidity (around 60-70%). And they don't like drafts, especially dry air from heat vents, which can cause brown leaf tips and shriveled flower buds. Short of turning your home into a misty rain forest, there are a few easy ways to raise the humidity for your house plants. Colorful, bright, fuzzy blooms are the hallmark of this South American flowering shrub. It's also easy to grow -- and, well -- just plain fun to have around. 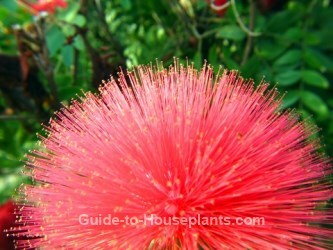 If you can meet it needs for warm sunlight and moist air, you'll keep this Powder Puff blooming every year. 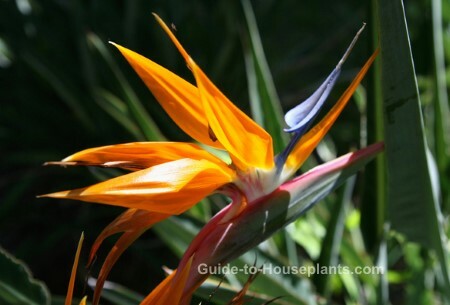 Broad leaves -- like that of the banana plant -- surround the vibrant orange and blue crested blooms of Bird of Paradise. 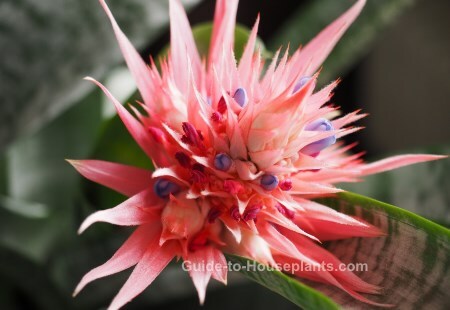 This is one of the most exotic types of tropical flowers you can grow indoors. Buy a mature plant, otherwise you'll wait years for those spectacular flowers. One of the showiest types of tropical flowers from Africa, vivid red Glory Lily will add a new dimension to your indoor garden. 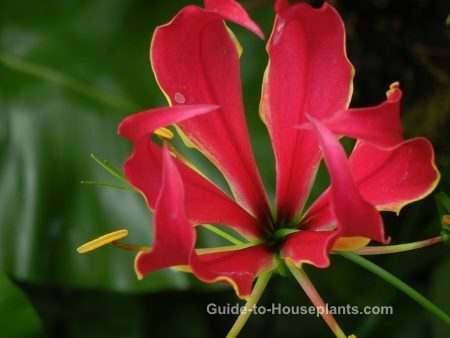 You'll need to give Glory Lily a strong support, so train its twining tendrils to climb a trellis. It's easy to do -- just use florist's wire to attach the leafy stems to the trellis and they'll soon grasp hold. For tropical beauty indoors, the flamboyant flowers in the Zingiberaceae (ginger) family deliver drama. Members of this clan are adding breezy Polynesian style to more and more homes. It's easy to see why they're gaining popularity. Red Ginger (shown here) and Siam Tulip grow quite well in containers. Give them plenty of bright light and they'll give you a show of brilliant blooms for months on end. Of the many species in the Bromeliad family, only a handful are commonly cultivated indoors -- this beauty is one. Called the Urn Plant for the way it captures rain, its flower spike makes it one of the showiest of all.